Cabalist of the eighteenth century; lived and died in Smyrna. He possessed an extraordinary memory and was thoroughly acquainted with Talmudic and rabbinic literature. He composed twelve works, among which were commentaries on the "Mishneh Torah" of Maimonides, the "Halakot" of Asher ben Jehiel, and the ritual codes. 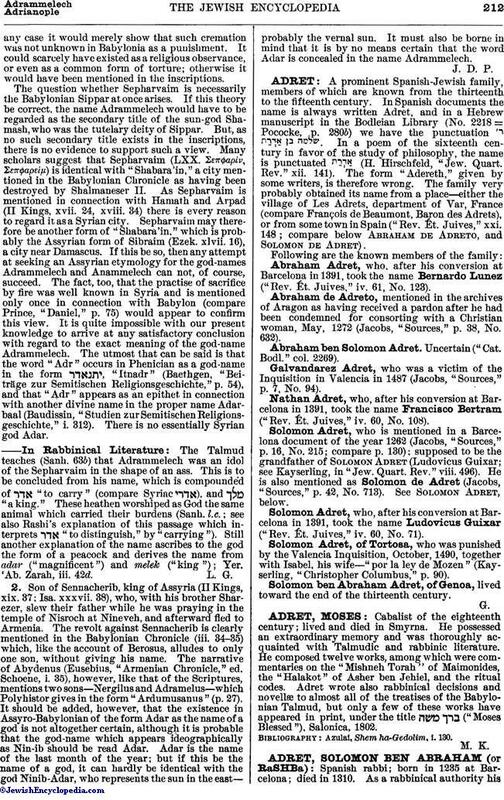 Adret wrote also rabbinical decisions and novellæ to almost all of the treatises of the Babylonian Talmud, but only a few of these works have appeared in print, under the title ("Moses Blessed"), Salonica, 1802. Azulai, Shem ha-Gedolim, i. 130.